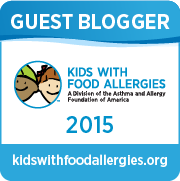 I have another great food allergy friendly restaurant experience to tell you about. We traveled to Penn State in State College, PA this weekend as a fun little getaway and family reunion. My cousin is graduating from PSU this spring, so it was time for all of us to meet at PSU for some family time. Of course, when planning any travel or long term trip that will involve eating out a restaurants, my first thought is...how am I going to feed Little Guy safe food allergy friendly food? 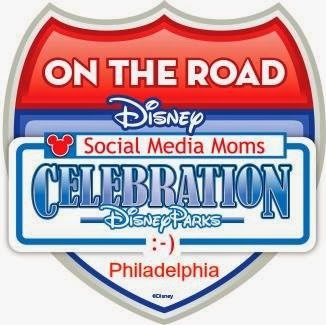 CALL AHEAD: Since I went to school at Penn State, I already knew about a few restaurants that might work well with food allergies (and kids!). I called the Allen Street Grille, The Deli (where we had a previous great experience) and the restaurant at Toftrees where we were staying, The Down Under Steakhouse. All restaurants said they had previous experience cooking for food allergies and could accommodate our requests! REVIEW THE MENU ONLINE: I usually order the same thing for Little Guy - a plain burger or chicken, steamed veggies and potato or rice. However, I always like to see if there's anything different on the menu he might be able to have. PACK OUR OWN FOOD: I planned to pack enough food that would get him through the weekend - even if we couldn't find a restaurant that could serve him safe food. USE OUR CHEF CARD: The chef card is what I depend on to communicate how SAFE we need to be when cooking food for Little Guy. It also helps the information get directly to the chef. We ended up eating two meals at Toftrees' Down Under Steakhouse since it was the most convenient place to meet family on a busy weekend at Penn State. The kids loved just walking from our hotel, and especially loved playing on the open green space outside of Toftrees golf course. We ate dinner and breakfast at The Down Under Steakhouse (although I only got a photo of breakfast). Two great meals for everyone! 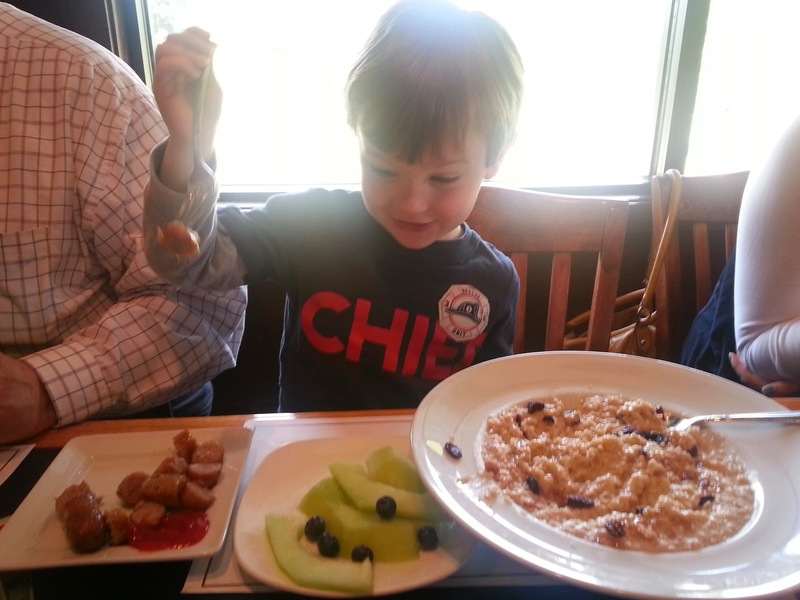 This was the first time we ordered breakfast for Little Guy at a restaurant. Breakfast is usually such an egg and dairy-focused meal that we haven't really tried to go out for it much. But The Down Under Steakhouse had a number of great options. 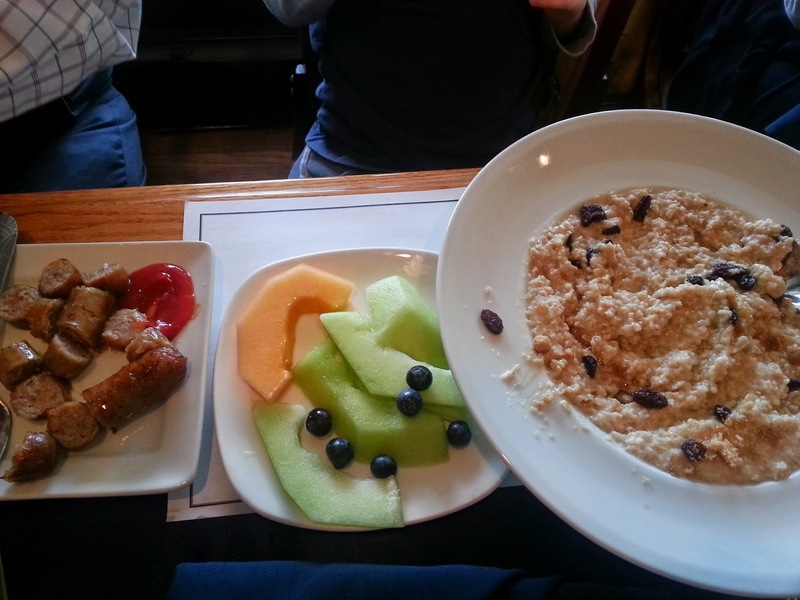 Little Guy ordered the oatmeal, sausage and fruit (potatoes and bacon were other safe options!). 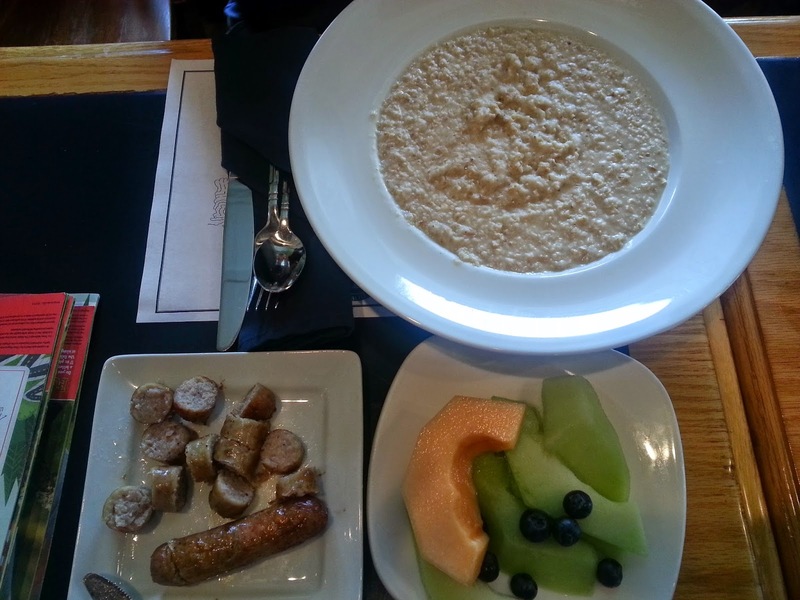 Look at that oatmeal bowl - ENORMOUS! He loved it. Especially when we added a little brown sugar and raisins. Little Guy thoroughly enjoyed his food allergy friendly meals as you can see!! Food: American-style food focused on steak, burgers and chicken (of course since it's a steakhouse!). Small kids menu for breakfast, but great food overall. Allergy-Friendly: Yes. As mentioned above we had a great experience with this restaurant and the staff. Atmosphere: Dark wooden furniture makes it feel more upscale, yet it's a casual place that's great for kids too. It overlooks the golf course and we walked right outside and down some stairs for the kids to play in the grassy area while waiting for our meals. A great place for kids and adults. I'll be sure to add my great review to AllergyEats! You may also like my list of other food allergy friendly restaurant reviews with photos of some of the food! So glad you all had a nice time visiting with family at Penn State and could find allergy friendly restaurants too, you certainly had a beautiful weekend for it!